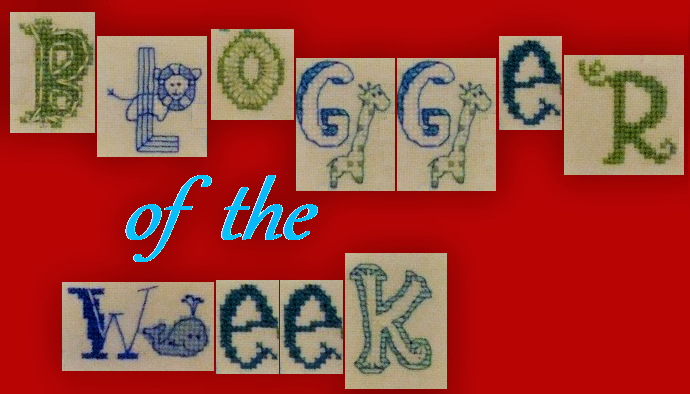 So great to meet a new-to-me stitcher through Jo's Blogger of the Week. Nice to meet you, Sandy, and to see some of your great stitching. I particularly love the Stoney Creek cardinals. So great fro you that you could tour some of the places where space took its start. Thanks Brigette. I hope to get around to each of your websites this weekend. Y'all, as I read the above about me...I simply couldn't believe I left off that I have two of the greatest dogs in the world. They are the stars of the show on my blog. I guess I had a senior moment! Hello Sandy! I am so glad to meet you. I am your newest follower. I had a nice look around your blog. Just lovely! Thanks Vickie, I hope to get home this evening and visit everyone's blog. Thank you Lesley, I hope to visit you as well this evening. Greetings Sandy: It is a pleasure to read about you and your stitching. Hi Sandy, nice to meet you, i also love the cardinals from stoney creek. Thank you Martina, I do love cardinals. That turned out to be one of my favorite stitches ever. Lovely to get to know you more ,so nice to read about you and your stitching . Like Martina I love your Cardinals. Oh my goodness, just popped into your site. Your roses are so pretty. I love to attempt to grow them. nice to meet you. Your Cardinals are wonderful. Thanks so much. Cardinals are a favorite of mine. Very pleased to meet you Sandy. You have some very beautiful stitching. I love your Cardinals. Thank you Faith. I just popped into see some of your finishes. They are great! Hi, Sandy, nice to meet you! Your stitching is lovely and I especially like your BBD piece and Bluebird Out My Window (that one's on my wish list) - I like the brighter colors you used. Off now to take a peek at your blog. Thank you Deb. 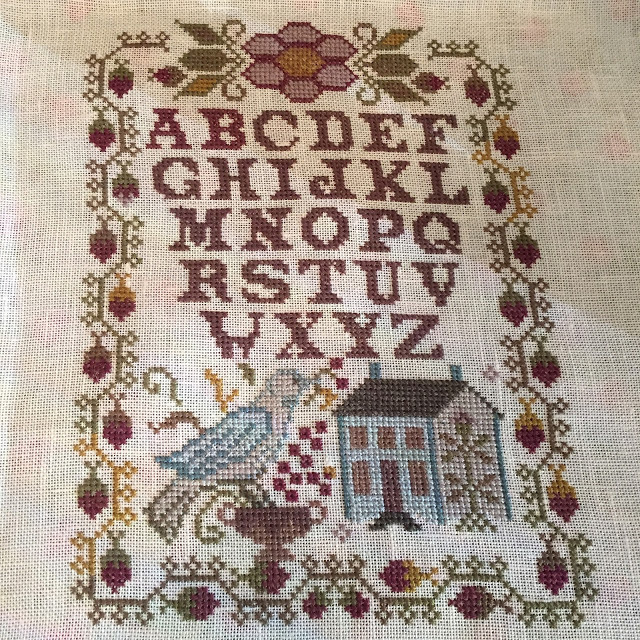 I really love the bluebird stitch. It is still sitting out although I intended it to be just a seasonal piece for spring. So nice meeting a fellow stitcher. I am a teacher of English as a foreign language in a school in Greece! Hope everything goes well with your life!I love your stitching!AriadnefromGreece! Thank you Ariadne. I so hope to get into reading all the new blogs I have seen here when I get Mom settled. I am bringing her home from rehab to my home today. You've worked on some wonderful projects Sandy. I bet your stitching time will be depleted when your grandchild comes along ... I know mine was. Yes, Julie I am sure it will, but I am looking forward to the grandson's arrival. My mother's fall has put a damper on things for now. Hello, Sandy! I wish Home Ec hadn't taken a downturn; it was happening in my school when I was a high schooler -- we were one of the last classes to have it. Due to being very rural, it lasted longer than most areas... We're a little nutty about space in our house too. I envy your wonderful Houston trip! You have such a cheerful collection of stitches! I really love the sunflower pillow and the little pie plate (muffin tin?) finish! Thanks Rosey. I love that tart pan finish too. That is my first one of those, but I would really like to do more of those. Hi Sandy, nice to meet you! I love little table with the autumn/harvest themed pillows, the colours on them are so nice and bright. Thanks Leonore, I made all of them into pillows after that picture. I loved how they turned out. I enjoyed reading more about you, Sandy! I'm glad we've found each other's blogs and always look forward to your sweet comments :) Having a husband who is a great gift-giver must be very special (does he give lessons--ha ha!!). I really should rent him out for that. He is quite good at it. I am not nearly as good at thinking of those clever things. This was so interesting, Sandy! That cardinal piece is one of my very favorites that you have done. 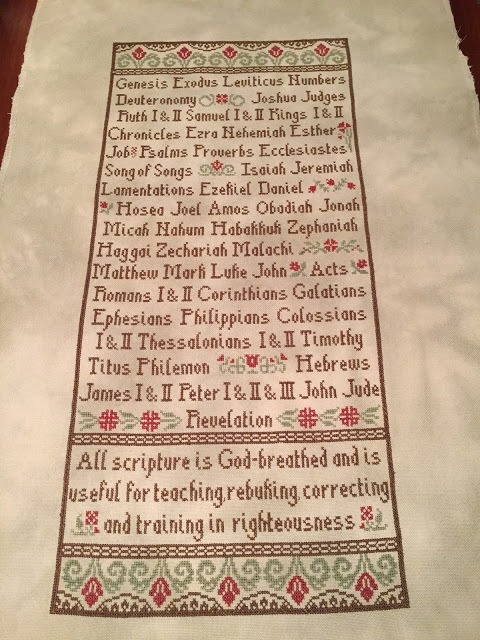 I enjoyed seeing the stitchery that hung in your classroom. So meaningful. 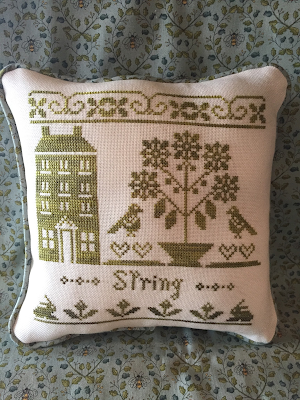 So very lovely to meet you, Sandy, and to read all about you, your teaching and your stitching. That trip to NASA - wow! That would have been marvellous. Love the cardinal piece - so very pretty. Sandy, I enjoyed reading more about you, I was going to mention you left off your 2 beautiful dogs but see you caught that lapse!! 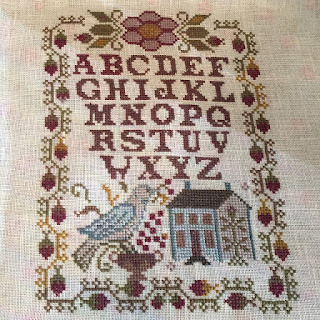 I think your recent cardinal stitch was my favorite as I'm partial to anything with birds but all your work is lovely. I think it's a real shame that schools have dropped HOme Ec, necessary life skills that everyone would benefit having.